Giveaways in the industry of cryptocurrencies have always been straddled with issues. We had the ETH scam-bot giveaways whereby they would appear on famous Twitter feeds requesting ETH and promising to return more. We had the Waltonchain giveaway to its own employee. And now, we have Justin Sun giving away Tesla cars to, well, no one. This doesn’t mean that all giveaways in the cryptocurrency industry are scams. Stellar gave away plenty of their token when they partnered with blockchain.com. Even Coin Rivet has run a competition, but in doing so we have proven that this was an actual, legitimate competition. Other competitions or giveaways are quite clearly bogus though. The ETH scams that ran during the bull run were quite clearly fake. What is worse is that so many people fell into the trap. The scam was simple: you send some ETH to a wallet and they promise to send even more back to you. Of course, they never did. If you are having to provide money – either fiat or cryptocurrency – to enter a giveaway in the cryptocurrency space, steer well clear. A much more amusing and unfortunate giveaway that went horribly wrong was one run by Waltonchain. 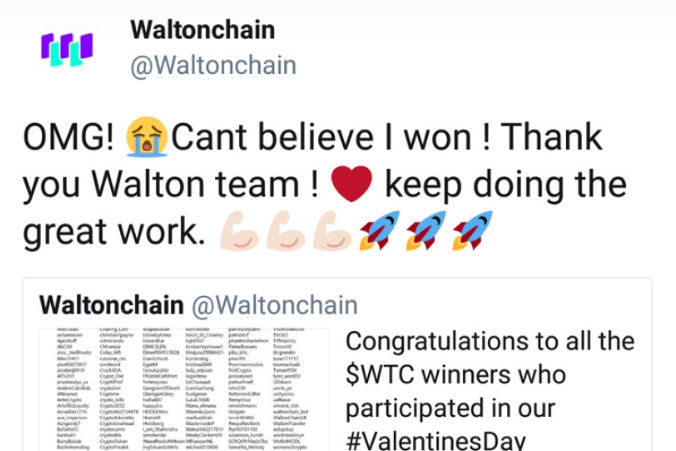 Its giveaway ended up with the winner – one of its own employees – forgetting to log out of the Waltonchain Twitter account. Therefore, their celebrations didn’t look too good for the niche cryptocurrency. The most recent giveaway that appears to have gone wrong involves Tron founder Justin Sun. He had promised to give away Tesla cars to many of his followers. However, as an online Twitter sleuth has found out, it appears that not many of the winners are actually real people. @CryptoJohnGalt has dug deep into this and has provided his findings. This isn’t particularly surprising considering that there have long been accusations that Justin Sun’s many Twitter followers are mainly bots. When you see giveaways and competitions, whether they be in the cryptocurrency industry or anywhere else, always do your own research on the topic. There are many legitimate giveaways, but there are also many false ones looking to scam you one way or another. Stay safe out there. Will the market reversal save altcoins?